If you have a garden, you know that grass and weeds pop up in the most annoying places. Grass has its place in the yard, but around plants and shrubs, it is unsightly and takes much-needed nutrients from the other plants. You will want to remove it as soon as it appears so that the work doesn't pile up and become overwhelming. There are a few ways that you can get rid of the grass without killing the surrounding shrubs. Cover large areas of grass with dark plastic. You can cover the entire landscaping area with this plastic and make holes for your shrubs. Then, cover the plastic with mulch. This will keep grass from ever starting. If you are just covering the area to kill grass that is already there, hammer stakes into the corners of the plastic to keep it from flying away. Leave it down for about a week to completely kill the grass. 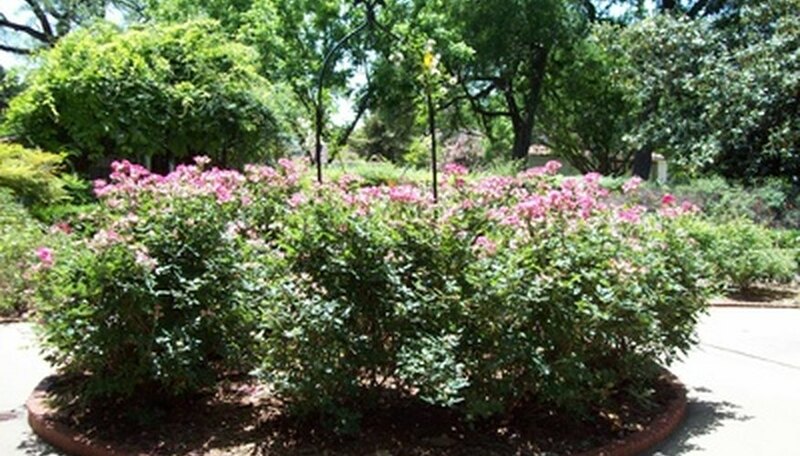 Cover the area around the shrubs with a thick layer of mulch. The mulch will cover the grass and block out the light, just like the plastic. Without light, the grass will die. Spray a selective herbicide over the area that is designed to kill grass but not plants. Always check the label to ensure that the plants near the grass will be safe. Pull the grass out by hand. Grab as much as you can and pull upward. If it is growing in a tough clay soil, this might not work well, and you might end up pulling only the blades without the roots. If this is the case, use a hand trowel to help you scoop out the roots too. Wear gloves to protect your hands.